Sunday marks the 20th anniversary of Bi Visibility Day, also known as International Celebrate Bisexuality Day. The day has been marked each year since 1999 to highlight biphobia and to help people find the bisexual community. According to the Pew Research Center, 40% of LGBTQ Americans identify as bisexual. Specifically, the study found that about 10 million people, or 4.1% of the U.S. adult population, identified as LGBT in 2016, according to the latest estimates from Gallup. This represents a modest but significant increase from 8.3 million people (3.5% of adults) who said they were LGBT in 2012. The same research showed that gay men and lesbians are more likely than bi people to be out in their every day lives. Overall, only 28% of bisexual people in the U.S. said that all or most of the important people in their lives are aware that they are LGBTQ. A recent study also showed that financial barriers still keep lesbian, gay, and bisexual patients from medical treatment. Bi Visibility Day highlights bisexuality and the challenges posed by biphobia and bisexual erasure, as well as celebrating the work of a growing number of local, national and international organizations around the world which champion bisexual visibility and equality. Last year there were more than 130 events marking Bi Visibility Day, from exhibitions, talks and film screenings to picnics and socials in bi-friendly bars. A host of public buildings around the world flew the pink, purple, and blue bisexual flag. 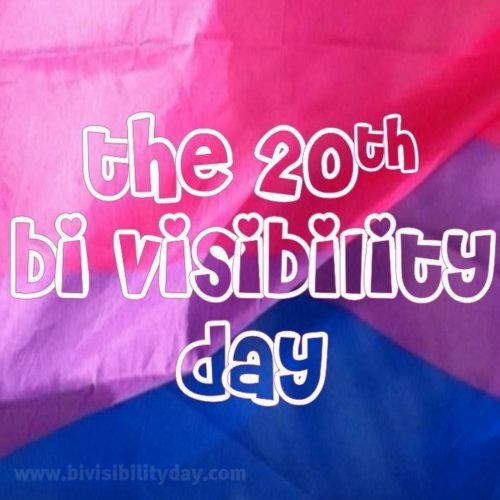 More information about Bi Visibility Day including events listings can be found on BiVisibilityDay.com. Bi Visibility Day also marks the start of #BiWeek – Bisexual Awareness Week – which runs until September 30.